1½ tbsp each oyster sauce and water. Thinly slice 2 skinned chicken breasts into strips and stir together with 1 tbsp Chinese cooking wine or dry sherry, 1 tbsp cornflour, ½ tsp toasted sesame oil and ½ tsp salt. Set aside. Cut 3 pak choi and 5 salad onions into 4cm pieces. Peel a 2cm piece of fresh ginger and cut this and ½ red chilli into matchsticks. Heat a wok over a high flame. Add 1 tbsp groundnut oil and cook the chicken, onions, chilli, ginger and 1 tbsp cashew nuts. 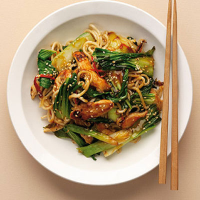 Stir-fry for 1 minute before adding the pak choi. Stir for 1 minute then add 1 tbsp Chinese cooking wine and 1½ tbsp each oyster sauce and water. Cook for 1 minute, toss in 300g straight-to-wok noodles and cook for 3–4 minutes, until warmed through.